Berlin. 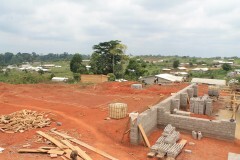 This year, 15 students from the Technical University of Berlin – the “Baupiloten” (“Building Pilots”) coordinated by Prof. Susanne Hofmann – will be developing and building a bilingual primary school in Bertoua, Cameroon, in collaboration with the Hope Foundation (a German/Cameroonian NGO) and local workers. The project was among the award winners of the Sto Foundation’s summer school competition 2014. Over a year has now passed since its inception in spring 2013 at the Technical University of Berlin. The design phase produced an innovative primary school concept, which developed with a focus on social, economic, and ecological sustainability and the incorporation of collaborative design methods. The design phase, which was completed in the Berlin studio in December 2013, required the students to look closely at the problems involved in the project from every angle of architectural practice. Not only did they have to engage theoretically with the economic, technical, and organisational aspects of planning a building project – they had to find feasible solutions too. And all of this had to take into account the local context in terms of cultural identity, building techniques, access to building materials, and the general climatic conditions. 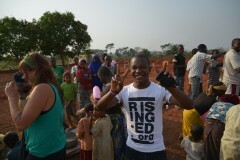 At the same time as finalising the design, the students organised events to present the project and raise funds. In addition to the Sto Foundation, the project gained many other supporters who provided equipment and donations in kind. Meanwhile, the Hope Foundation (HF) secured a suitable plot of land for the new building and accommodation for the Rising Education team (RE team). The first phase of construction took place between January and March 2014. The first two weeks consisted primarily of official meetings with local architects, aid organisations, the German embassy, and even the Cameroonian minister for primary education, Ms Youssouf Hadidja Alim. The team then visited nearby schools and organised workshops with the local people. This provided lots of information which – thanks to the flexibility of the building’s structure – enabled the team to adapt the project to the conditions on site and to the actual needs of its prospective users. At the same time, work began on the construction site. The land had to be cleared and straightened in parts. Temporary building site facilities were required in order to ensure production of the masonry blocks met the expected standards both in terms of quality and quantity. The building parts were then measured out on the ground and the foundation trenches were dug. 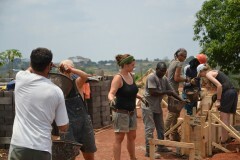 After several weeks of exhausting physical work, a number of local workers joined the team. A group of 21 Cameroonian architecture students also provided reinforcements for a week, marking a key milestone in the cultural exchange. The team left the construction site once all of the walls were complete, including the foundations and the plinth in the administrative wing, which consists of the secretary’s office, head’s office, staff room, and a multi-purpose hall. The walls are stabilised with a concrete ring beam and covered to ensure that they can withstand the rainy season without damage. In April, the students returned to Germany to continue their studies, but they are also working on collecting donations, updating information materials, and planning further events so that the first scheduled phase of construction can be completed in winter 2014/2015. 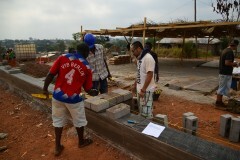 This will involve fitting the pre-cut roof elements and preparing two classrooms. With the support of the “Baupiloten BDA”, including Prof. Dr.-Ing. Susanne Hofmann and her department, as well as her academic colleague Kirstie Smeaton at the Technical University of Berlin, the students have successfully completed the first important stage of the project. They are already planning their return trip to Bertoua. Once again, the project is relying on financial support and donations in kind.